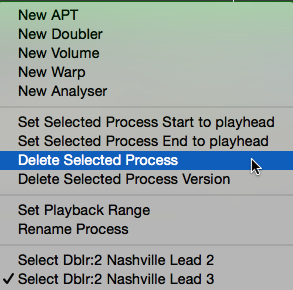 If a Process in a track or its output is not wanted, they can all be deleted together by RIGHT CLICKing on the unwanted Guide, Dub or Output Control Block and selecting from the pop-up menu shown right: Delete Selected Process. To delete only the currently selected Version of a Process, select Delete Selected Process Version. If you wish to rename the variable part of a APT Process name that is automatically created (i.e. the part between "APT" and "Guide" or "Dub"), RIGHT CLICK on the Guide, Dub or Output Control Block and select Rename Process from the pop-up menu. Type the new name into the field displayed and press the Enter key. For example if you type "Fred" into the "APT:Malcom-Guide" (or Dub) name field, "Fred" will replace the "Malcom". So, in this example the Guide will be renamed "APT:Fred-Guide", the Dub will be renamed "APT:Fred-Dub", and the Output will be renamed "APT:Fred-Output"
Similarly, you can rename the input and output names following "Dblr" (in Doubler Process) as shown right. Normally, you will not need to rename processes.